In winter 2013, along with a host of other celebraties, Jerome teamed up with the Debbie Curtis Big Band to produce a charity record in support of Viva -the charity campaigning for a vegan world and an end to animal suffering. 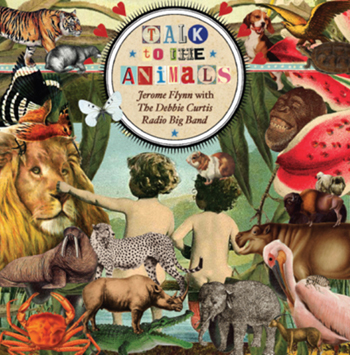 “Talk to the Animals” was originally written for the film Doctor Dolittle, by British composer Leslie Bricusse. This big band version would include many actors and singers contributing a line or two to the song. Full details of the talent and production history by Debbie Curtis can be found on the Viva website (note: this website contains images of animals suffering, which some readers may find upsetting). In addition to the main single, a limited edition version was recorded with just Jerome singing. Copies formed part of a charity raffle, which included other prizes such as signed Ripper Street and Game of Thrones exclusives, and raised over an extra £500.